Stay on a boat in Europe’s largest natural harbour, Poole. Discover Poole and the surrounding areas boasting some of Britain’s best beaches, one of Britain’s most exclusive places to buy a house and England’s first Natural world heritage site. Staying on a boat in Poole will give you stunning views of the harbour and serve as the perfect base to explore all that this area has to offer. Of course, if doing nothing is your objective, Poole enjoys above average hours of sunshine for the UK (for the sun seekers) and with the exclusive backdrop of Sandbanks staying on a boat is sure to be a unique experience watching the world go by. When visiting Poole you will have access to stunning, Blue Flag awarded beaches including Britain’s best beach, Sandbanks. Three miles of golden sands (raked and cleaned all year round), clear waters, waterside bars and restaurants await your visit. If you love nature and want to escape for the day, Poole offers an abundance of Green open spaces, award winning Parks and the national Trust Brownsea Island. Almost one fifth of Poole is made up by publicly accessible green space. Poole Park (with its lake at its centre) and Upton Country Park have been recognised as two of the finest parks in the country after each received a coveted Green Flag award. A visit to Poole should also include a trip to the studio at Poole Pottery and watch the throwers, artists and designers in action. Have a go at making your own masterpiece in the paint a pot area. Most of the marinas are located near the bustling quay. Enjoy crabbing on the quayside, explore historic Poole by walking the Cockle Trail, Poole Trail or Treasure Hunt with plenty of ice cream stops along the way. Inland the countryside is a haven for walkers, historians and for those just looking for a great cream tea! Take in countryside which still evokes the settings of the Thomas Hardy novels or visit one of the many market towns and picturesque villages. Take the ferry across the harbour entrance and visit The Purbecks, stopping off at the beach at Studland, a National Trust nature reserve of sand dunes and heath which runs all the way to Old Harry Rocks – a chalk stack alongside dramatic cliffs. The Purbeck area includes; Lulworth, Swanage, Studland, Wareham, Corfe Castle, Durdle Door, Langton and Worth Matravers, Wool and many other picturesque villages, all worth a visit. With many large scale annual events, staying on a boat provides the perfect platform to experience the likes of the Bournemouth Air Festival (the biggest free event of its kind in the UK), the beach volleyball festival and the British Beach Polo Championships. The Dorset and East Devon Coast World Heritage Site is England’s first natural World Heritage Site. Referred to as the Jurassic Coast, this area of geological marvel reveals 185 million years of the earth’s history, in just 95 miles of coastline. Journey through time with a walk along the coast, discovering periods of geological times including the Triassic, Jurassic and Cretaceous periods. Explore a stunning stretch of coastline containing a remarkable history. From romantic retreats, bases to explore and pure laid back luxury there is plenty of alternative accommodation in Poole. Beds on Board offers unique places to stay with boats to suit all tastes and budgets no matter what the reason for your visit. 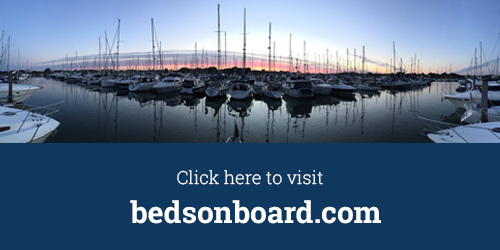 Sign up and search for your boat to stay on in Poole, the perfect way to getaway and explore. There’s so much to do you’ll have to stay again to discover it all!